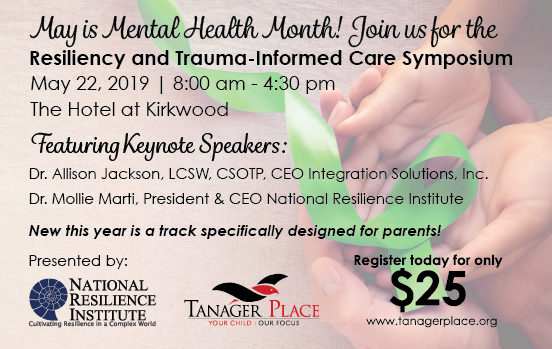 Tanager Place offers critical resources and support for educators, parents, care providers and community members to build resiliency in children and families who have experienced trauma. Trauma is a physically or emotionally distressing experience that affects individuals in different ways. By building resiliency—or the ability to bounce back from adversity—we help children who have experienced trauma learn to regain a sense of security and well-being. Because trauma can lead to a sense of hopelessness, resiliency training also helps instill a sense of capability in children, so they can feel confident in their ability to heal and self-regulate. Join us for this years Resiliency and Trauma-Informed Care Symposium on May 22nd! Keynotes will include Molli Marti, CEO of the National Resilience Institute and Allison Jackson, CEO of Integrated Solutions. Check out Allison’s Ted Talk here. Here you can find a variety of different resources to help you find services and programming for you and your child in the Cedar Rapids and surrounding area. These range from treatment to after school programs and crisis support. Here we have recommendations for children’s books, parenting books, and workbooks. Many of these children’s books center around identifying and recognizing emotions as well as exploring some difficult and possibly traumatic topics. These parenting books provide some different ways to connect and interact with your children. We also have a variety of workbooks referenced here about different topics from anger to ADHD to social skills. These can be purchased for your use through Amazon smile. Please reference Tanager Place on check out to help support our programming. Here our toolkit is provided to assist parents in understanding trauma and resiliency. There are different activities included that parents can use with their children to foster resiliency. In this section you will also find writings that can help in a variety of difficult situations. Here you can find different talks and presentations targeted toward parents and professionals on the topic of trauma and resiliency. Here are links to a variety of websites that provide good information for you and your family on the topic of trauma, resiliency, and parenting.